Copyright © 2017 by MusicAlliance Inc. All rights reserved. NEW! Click the Donate Button above to help support our mission! 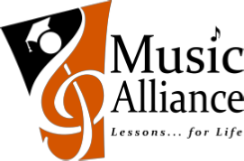 MusicAlliance admits students of any race, color, gender, religion, national and ethnic origin to all of the rights, privileges, and activities generally available to students in the programs offered. MusicAlliance does not discriminate on the basis of race, color, gender, religion, disability, national and ethnic origin, or any other category protected under applicable law in its programs, activities, or policies.